ANNAPOLIS, MD (January 5, 2009) – The introduction and movement of invasive and exotic forest pests is often accelerated and assisted by human activities. Firewood has great potential to introduce highly destructive forest pests into new uninfested susceptible locations. 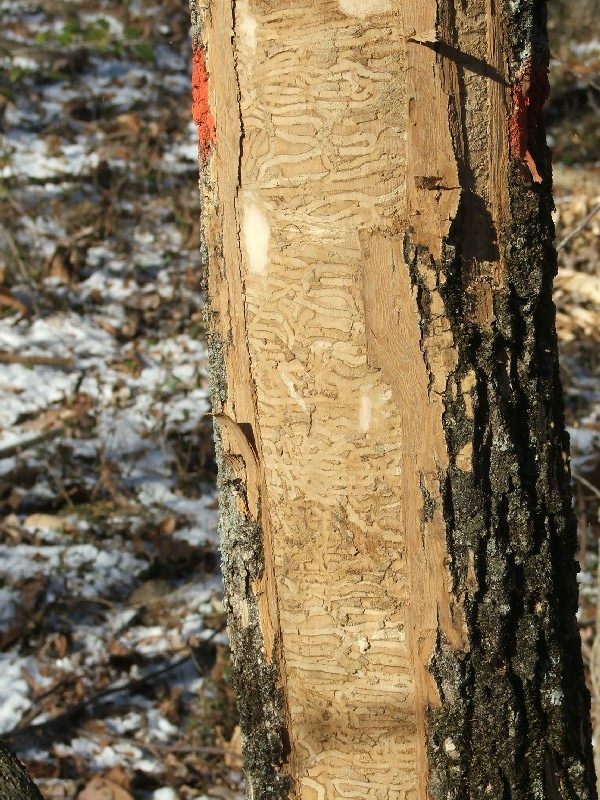 In Maryland, it is illegal to move hardwood firewood out of Prince George’s or Charles Counties because those areas are under quarantine for a devastating insect pest, the emerald ash borer. In many places, however, firewood is a pathway that is outside of normal regulatory restrictions and is moved largely by private individuals with little or no knowledge about quarantine or regulatory requirements. Because Marylanders are cutting, stacking and burning lots of firewood this month, the Maryland Invasive Species Council has chosen firewood as the January 2009 Invader of the Month. All types of firewood can transport invasive plant pests and diseases. Because of theemerald ash borer, more than 20 million ash trees have died in the Midwest. Long before this beetle was identified as the culprit responsible for killing ash trees in Detroit, Michigan and Windsor, Ontario, Canada, it was carried to uninfested areas on firewood and other ash wood products. Gypsy moths have caused millions of dollars of damage to forests in the eastern U.S. Gypsy moth eggs can be transported on firewood. Oak wilt is one of the most serious tree diseases in the eastern United States, killing thousands of oaks each year in forests, woodlots, and home landscapes. Oak wilt can be spread by insects that transport the fungal spores from infested firewood to healthy trees. Dutch elm disease has devastated our elm populations, and continues to kill more elms every year. It also can be spread by insects carrying fungal spores from infested firewood to healthy trees. The Sirex wood wasp, native to Europe, Asia, and northern Africa, feeds primarily on pines and has been documented as causing up to 80% tree mortality in Southern hemisphere countries where it has been introduced. Sirex larvae can tunnel in logs for over a year, long enough for the infested wood to be cut for firewood. The Asian longhorned beetle, a threat to many hardwood trees including maples, birch, elm and ash, has been detected and quarantined in Illinois, New York, New Jersey, Massachusetts, and Ontario, Canada, where eradication efforts are underway. Firewood that looks normal actually might still be infested with these and other forest pests and diseases. State and federal agencies have implemented regulations to address a number of known pest pathways in areas where they are known to occur. For example, emerald ash borer quarantines in infested states (Michigan, Illinois, Indiana, Maryland, Missouri, Ohio, Ontario, Pennsylvania, Virginia, West Virginia, and Wisconsin) help to prevent potentially infested ash products from moving out of emerald ash borer-infested areas. But a wide variety of invasive, exotic forest pests and diseases may be transported to new areas on many different species of firewood. Uninfested states that may be impacted by these introductions have limited ability or authority to inform or interact with interstate travelers and tourists. Many states have established quarantines or policies to prevent invasive plant pest introductions on firewood. Kentucky state parks do not allow out-of-state firewood to be brought into campgrounds. Minnesota requires that all firewood sold or distributed across state boundaries or more than 100 miles from its origin be labeled with point of harvest. New York State has an aggressive emergency regulation restricting the importation and movement of firewood. Pennsylvania has banned the importation of out-of-state firewood unless it is kiln-dried or USDA certified. In Maryland, the Department of Natural Resources has a policy designed to prevent campers and other visitors from bringing outside firewood onto all DNR owned or managed properties.